It seems that all of us have completely misunderstood what the desaster of New Orleans is all about... Thousands of dead people are not the problem - the message is the problem! At least that's what seems to be going through the mosquito-sized brains that control the White House nowadays. Since it became clear that Mr. Bush gave a pretty bad performance early on in the crisis, the administration has used every tool available to them to change the message. Helping people in the devastated areas has been at best an afterthought. How about this article in the Salt Lake Tribune about the 1400 firemen from all over the country who spent one day in a sexual harrassment training this last Sunday, instead of sending them off to New Orleans to help? Now the training session itself is mostly what can be expected from FEMA nowadays after all its leadership has been replaced by unsuccessfull lawyers and branding managers of Bush's last campaign, so that's just the usual outrageous scandal laced with insanity like so many others coming out of this government. But as specific orders began arriving to the firefighters in Atlanta, a team of 50 Monday morning quickly was ushered onto a flight headed for Louisiana. The crew's first assignment: to stand beside President Bush as he tours devastated areas. 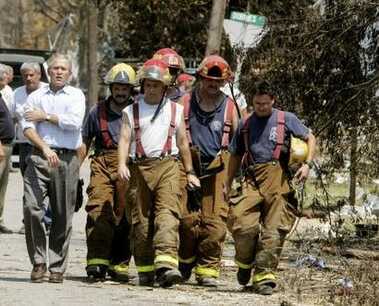 So firemen that had been sent to help by their home towns from all across the US, who were more than eager to help and just wanted to get out there and rescue somebody were instead used by Mr. Bush and his aides as a heroic background for one of his endless photo-ops all across the desaster area. Mr. President, rolling up your sleeves does not make you a man.